رحمدل, سمانه. (1391). رنگ، ابزار خلق منظر؛ طرح لاسوس برای نمای خیابانیِ یک مجتمع مسکونی. 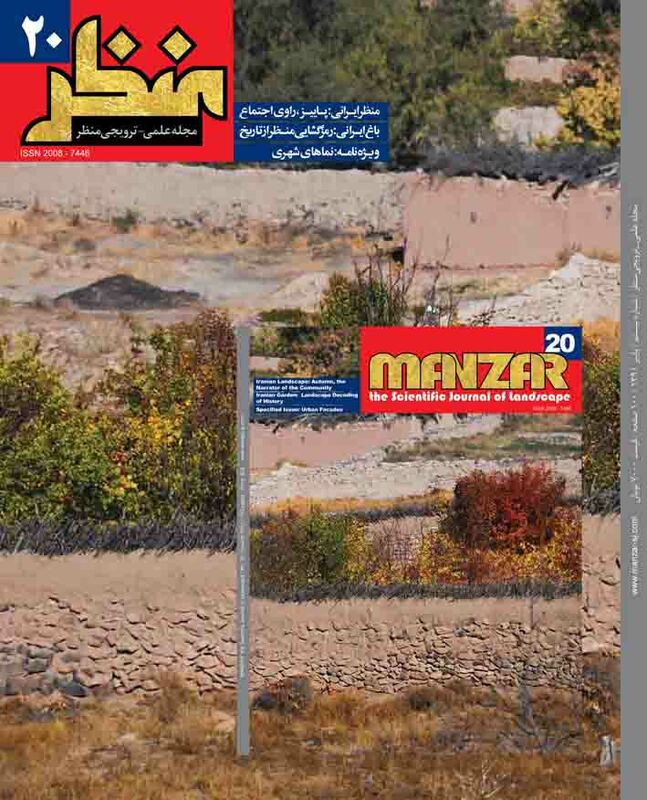 مجله علمی-ترویجی منظر, 4(20), 62-65. سمانه رحمدل. "رنگ، ابزار خلق منظر؛ طرح لاسوس برای نمای خیابانیِ یک مجتمع مسکونی". مجله علمی-ترویجی منظر, 4, 20, 1391, 62-65. رحمدل, سمانه. (1391). 'رنگ، ابزار خلق منظر؛ طرح لاسوس برای نمای خیابانیِ یک مجتمع مسکونی', مجله علمی-ترویجی منظر, 4(20), pp. 62-65. رحمدل, سمانه. رنگ، ابزار خلق منظر؛ طرح لاسوس برای نمای خیابانیِ یک مجتمع مسکونی. مجله علمی-ترویجی منظر, 1391; 4(20): 62-65. نمای خاکستری، به‌جامانده از فرآیند مجتمع‌سازی برای طبقة متوسط جامعه، میراث ناخواستۀ مدرنیسم بر بدنة خیابان‌ها است. یکنواختی و مشابهت نماهای بتنی، فضاهای همسان و کسل‌کننده‌ای را ایجاد کرده که هم بر سیما و نمای شهر تأثیر منفی دارد و هم مانع احساس تعلق ساکنین به محل زندگی خود می‌شود. این نماها به‌ عنوان بخشی از یک معماری با ساختار و شکل از پیش تعیین‌شده از ظرفیت‌های محدودی جهت مداخله و نوسازی برخوردار است. مجتمع مسکونی باتیژ در شهر اوکانژ نمونه‌ای از این مجتمع‌هاست که تأثیر منفی فضای آن بر نمای شهر و ساکنین مجتمع، شهرداری را به بازنگری در فضای باز مجتمع و نمایی که برای شهر رقم زده بود، واداشت. "برنارد لاسوس"، معمار منظر فرانسوی طراحی و اجرای پروژة بازسازی نمای مجموعه را بر عهده داشت. لاسوس پیش از ورود به عرصة منظر سال‌ها به ‌عنوان نقاش شناخته می‌شد و فضاسازی مبتنی ‌بر رنگ‌آمیزی و استعاره‌های هنری مجازی از راهبردهای اصلی وی در طراحی منظر به ‌شمار می‌رود. در پروژة بازسازی نمای مجموعه مسکونی باتیژ، لاسوس از مجاز و استعاره در قالب نقاشی بر دیوارهای مجتمع بهره می‌گیرد و با تأثیرپذیری از زمینة فرهنگی- مکانیِ مجموعه و درگیر کردنِ کانسپت طرح با عناصر عینی- ذهنی محیط، توانسته نقاشی دیواری را از چارچوب‌ هنری غیراجتماعی خارج کرده و ضمن آفرینش فضایی مطلوب برای ساکنان، هویتی نوین و توأم با خوانایی به خیابان ببخشد. اهمیت پروژه در آن است که چالش یک معمار منظر- نقاش امتزاج این دو هنر و خلق فضایی شهری در قالب نقاشی دیواری است. در این نوشتار، رویکرد سوررئال لاسوس برای پاسخ به بحران عدم تعلق خاطر- ناشی از نماسازی یکنواخت- و دستاورد این رویکرد در قالب آفرینش باغ- شهر خیالی مورد بررسی قرار می‌گیرد. M.A. in Landscape Architecture, University of Tehran, Iran. Grey landscapes, resulted from construction of residential complexes for the middle stratum of the society, are the unwelcome legacy of modernism passed down to the streets of the cities. Homogeneity and similarity of concrete structures creates dull sceneries with negative effects on the total landscape of the city and prevents development of a sense of belonging for the inhabitants. These landscapes, which are a part of pre-designed architecture, provide little space for renovation and reconstruction. Batigere residential complex in Uckange city is an example of such constructions, whose negative effects on city’s landscape and the inhabitants forced the municipality to reconsider the public place of the complex and the landscape it had created. Bernard Lassus, a French landscape architecture, supervised the reconstruction project. During the reconstruction project of Batigere residential complex, Lassus used metonymy and metaphor in the form of wall painting. Deriving from the cultural-positional background of the complex and combining the concept of the design with the real-mental environment, Lassus moved the concept of wall painting beyond an asocial art while creating a favorable environment for the inhabitants and bestowing a new pleasant identity to the street. The significance of the project lies in the attempts of a landscape architecture and painter in combining the two arts and creating an urban landscape in the form of wall painting. This paper analyzes Lassus’ surreal approach to removing the sense of detachment –resulted from homogeneous construction– and the achievements of his approach from identity, esthetic and functional standpoint. Lassus’ plan for covering the multiculturalism of the complex was painting a virtual garden containing various cultural items of different civilizations instead of constructing a real garden. This approach was adopted to give identity to the complex. Batigere’s wall painting can be regarded as a surreal interpretation of natural elements. The painted apartments and natural elements are Lassus’ chosen scenes minus their reality, which have left behind the time and space to which they belonged and have reached a new two-dimensional ground. Lassus believes that the move toward “imagination” is the way to reach the environments which are perceptible by different cultures. The more imaginary the environment, the more interpretations can be deduced. This imagination-based creation is a type of pluralism in the form of collage which reproduces the identity-seeking mentality of the addressee with a surreal identity and pluralistic approach. From esthetic and functional standpoint, the imaginative painting harmonious with natural elements has been very successful in beautification of the surrounding streets. Spectators on foot or in vehicles pass the street and experience a colorful scene. This colorful scene has omitted boring elements unpleasant to the eye and has created a more attractive street. Furthermore, the pluralistic and varied scene has redefined the mental concept of street based on varied elements of the painting, and this has resulted in the street to be more visually readable. The target of the project was creating a new landscape which would give “identity” to the inhabitants of the complex and, in the larger scale, would result in more visual readability for the street based on “beauty”. The architect’s skill in choosing the appropriate tools and his deep understating of the context, time and addressee created an imaginative environment by use of “wall painting” as a limited tool. This environment answered to the multiculturalism of the complex and created a visually readable scene with a limited budget.